D = 4186 pc (Kim et al. 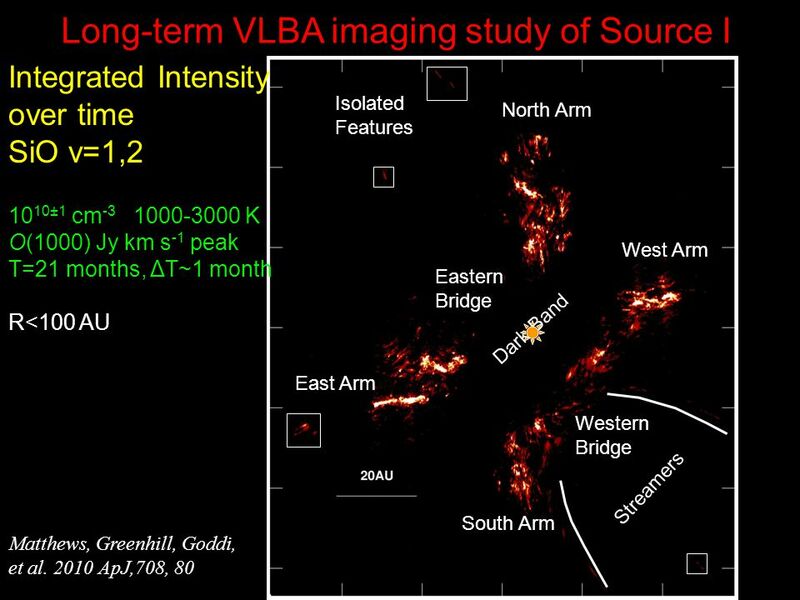 2008) L ~ 105 L O(200) km s-1 outflow (H2) (Kaifu et al. 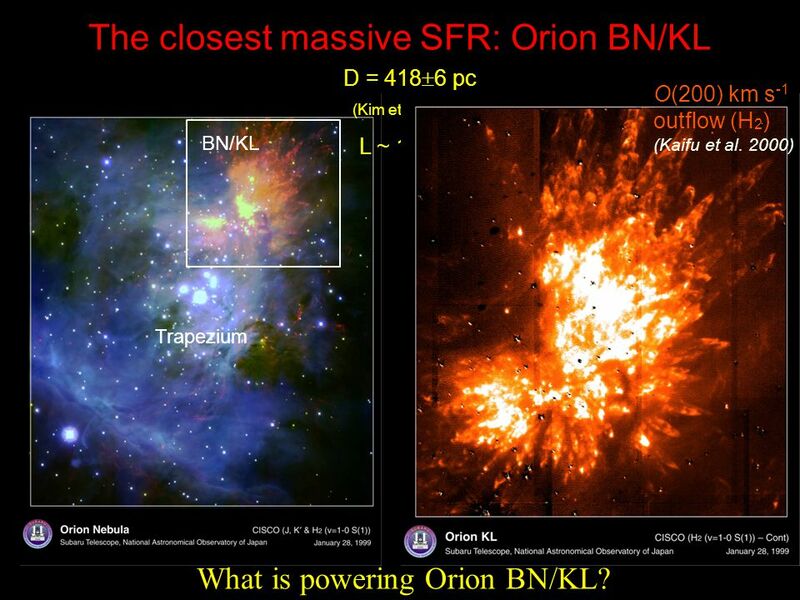 2000) BN/KL Trapezium What is powering Orion BN/KL? 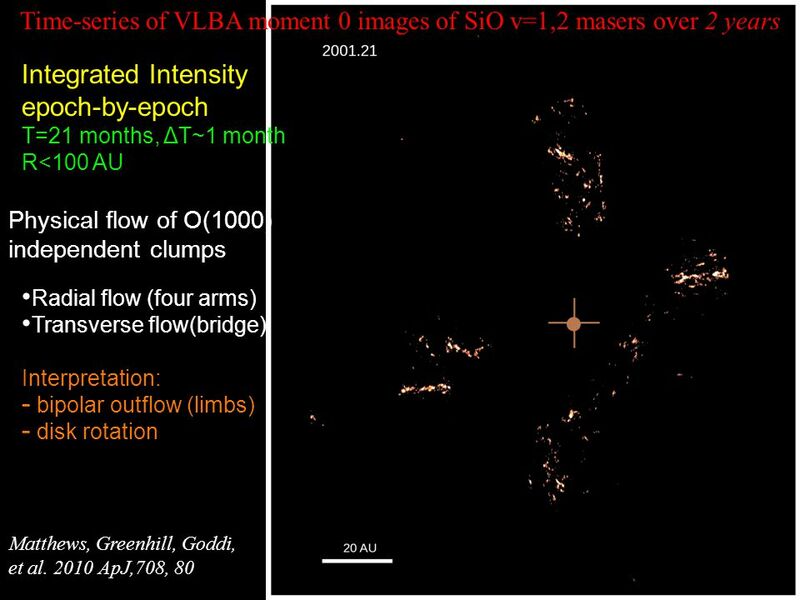 7mm SiO v=0+H2O 1.3cm (VLA ) 18 km/s Dec (arcsec) 500 AU Proper motions of SiO maser spots over 4 epochs open Q: what confines flow? open Q: what enables 102x spread in density implied by species overlap? 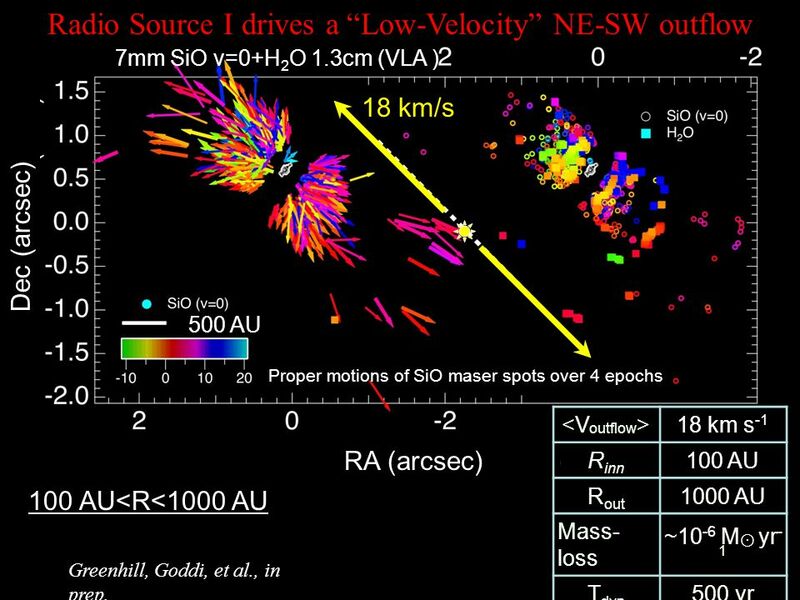 <Voutflow> 18 km s-1 Rinn 100 AU Rout 1000 AU Mass-loss ~10-6 M⊙ yr-1 Tdyn 500 yr RA (arcsec) 100 AU<R<1000 AU Greenhill, Goddi, et al., in prep. 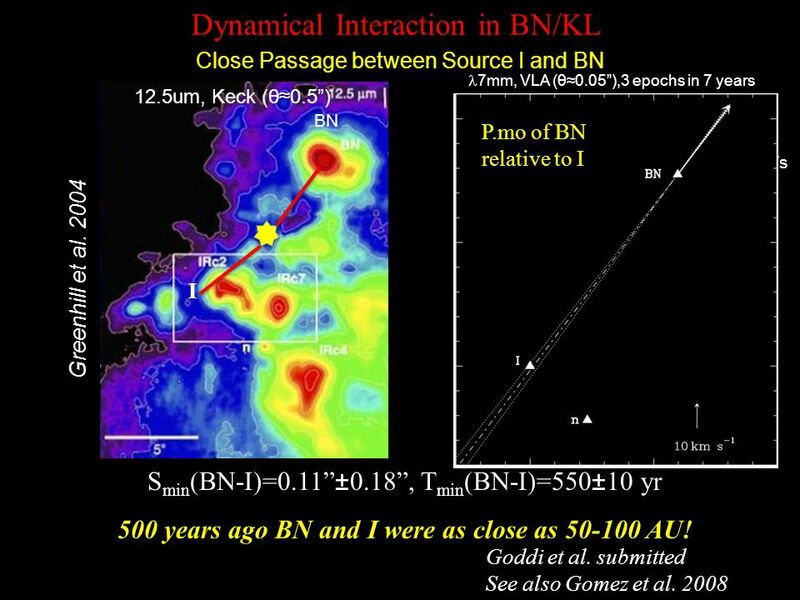 11 500 years ago BN and I were as close as 50-100 AU! 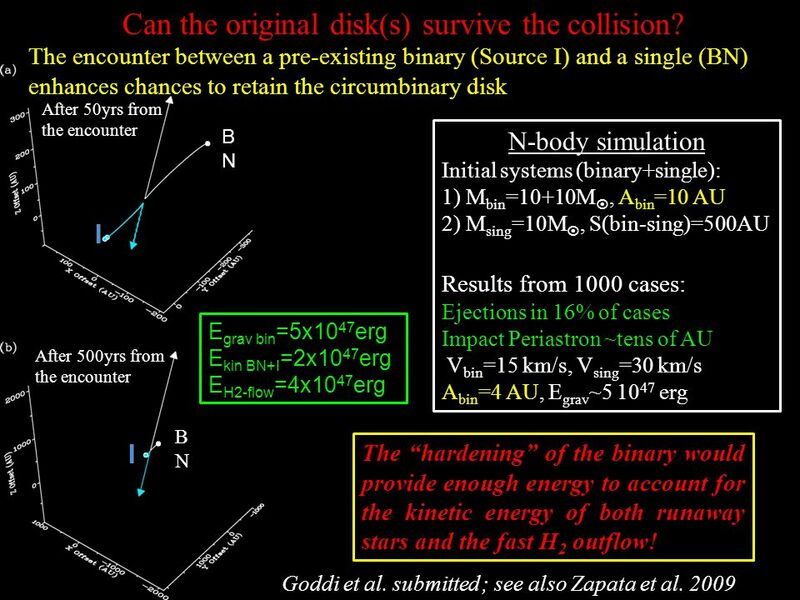 13 Can the original disk(s) survive the collision? 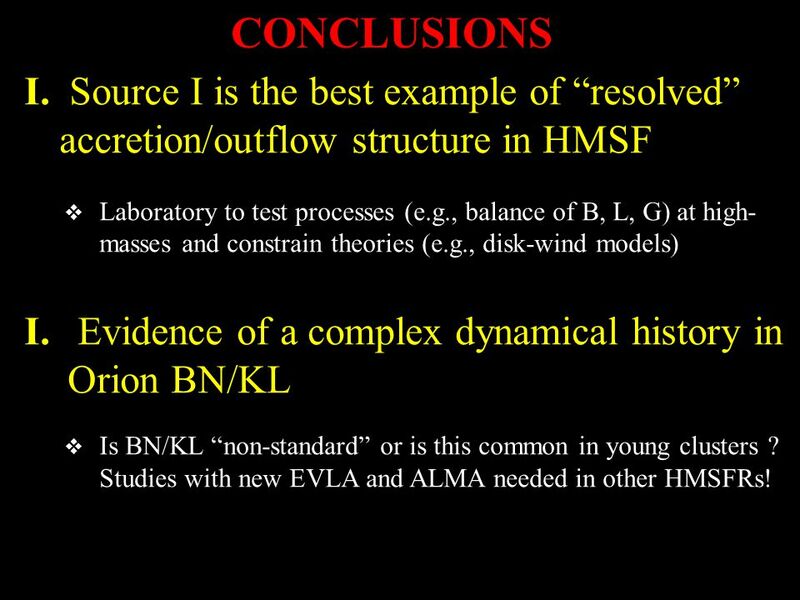 14 CONCLUSIONS Source I is the best example of “resolved” accretion/outflow structure in HMSF Laboratory to test processes (e.g., balance of B, L, G) at high-masses and constrain theories (e.g., disk-wind models) Evidence of a complex dynamical history in Orion BN/KL Is BN/KL “non-standard” or is this common in young clusters ? Studies with new EVLA and ALMA needed in other HMSFRs! 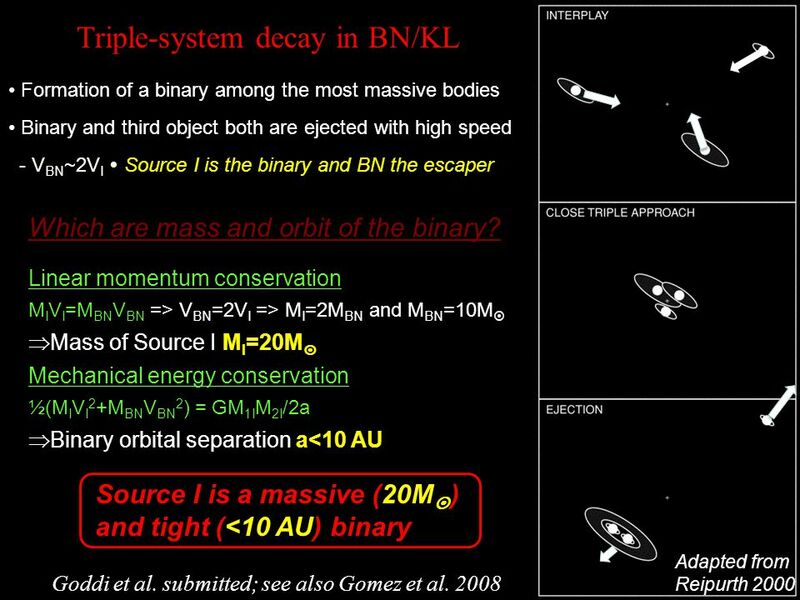 2 LESSONS LEARNED 1) Whatever is the actual history of Source I in BN/KL, our detailed study will drive people to figure out the balance of physics in a massive YSO when B, L, G are all at work 2) Is BN/KL “non-standard” or dynamical events common in massive, dense protoclusters? 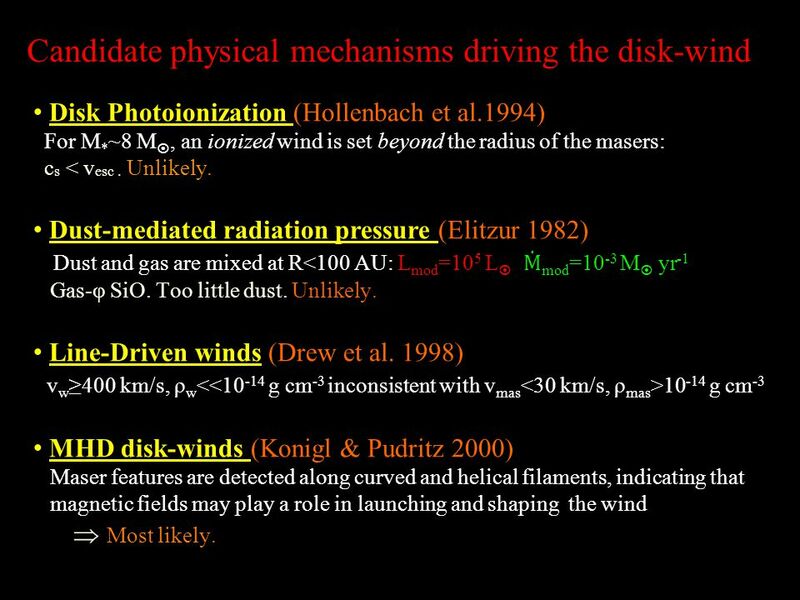 Disk Photoionization (Hollenbach et al.1994) For M*~8 M, an ionized wind is set beyond the radius of the masers: cs < vesc . Unlikely. Dust-mediated radiation pressure (Elitzur 1982): Dust and gas are mixed at R<100 AU: Lmod=105 L, Ṁmod=10-3 M yr-1 Gas-φ SiO. Too little dust. Unlikely. Line-Driven winds (Drew et al. 1998): vw≥400 km/s, ρw<<10-14 g cm-3 inconsistent with vmas<30 km/s, ρmas>10-14 g cm-3 MHD disk-winds (Konigl & Pudritz 2000): Maser features are detected along curved and helical filaments, indicating that magnetic fields may play a role in launching and shaping the wind Most likely. 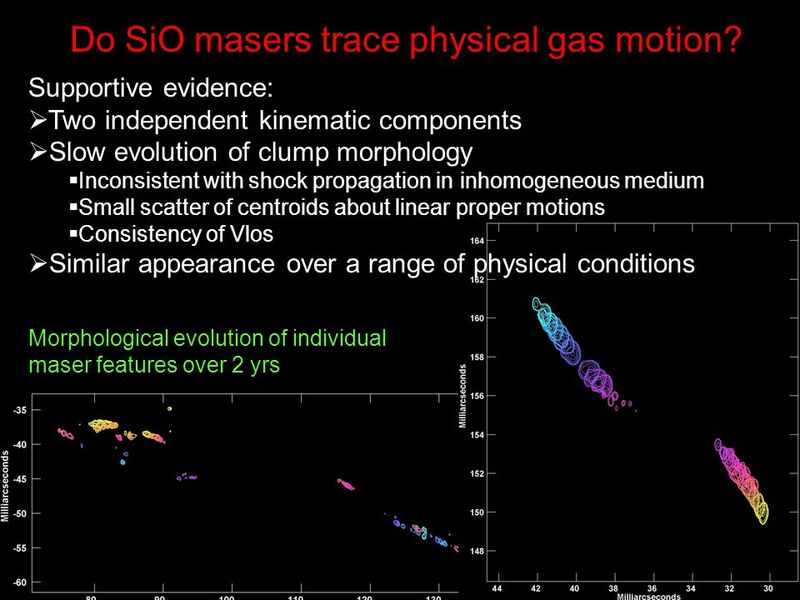 16 Do SiO masers trace physical gas motion? 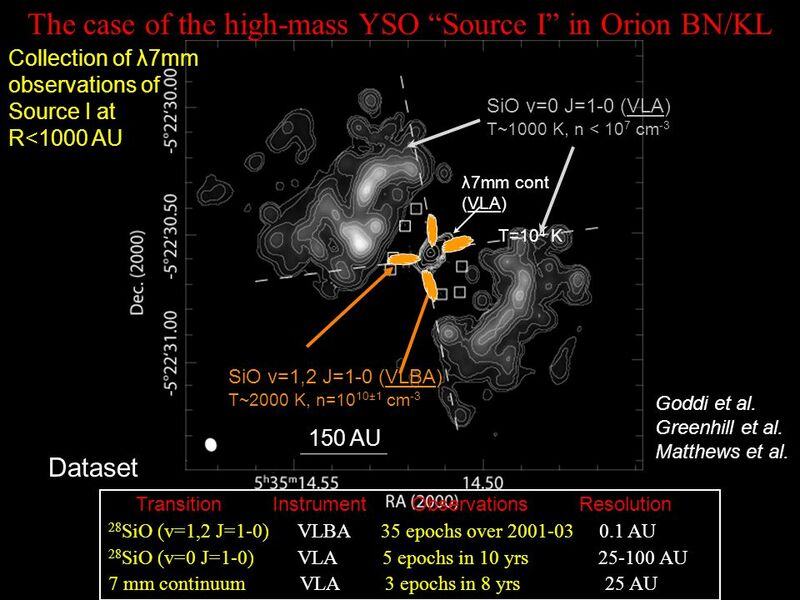 Download ppt "European Southern Observatory"
Infall and Rotation around Young Stars Formation and Evolution of Protoplanetary Disks Michiel R. Hogerheijde Steward Observatory The University of Arizona. 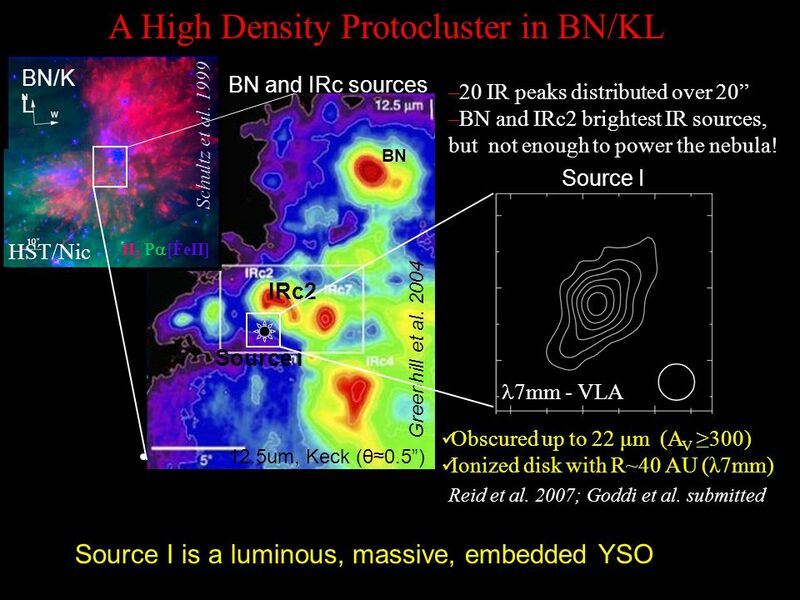 From protostellar cores to disk galaxies - Zurich - 09/2007 S.Walch, A.Burkert, T.Naab Munich University Observatory S.Walch, A.Burkert, T.Naab Munich. Massive Young Stars in the Galaxy Melvin Hoare University of Leeds UK. Circumstellar disks: what can we learn from ALMA? March ARC meeting, CSL. 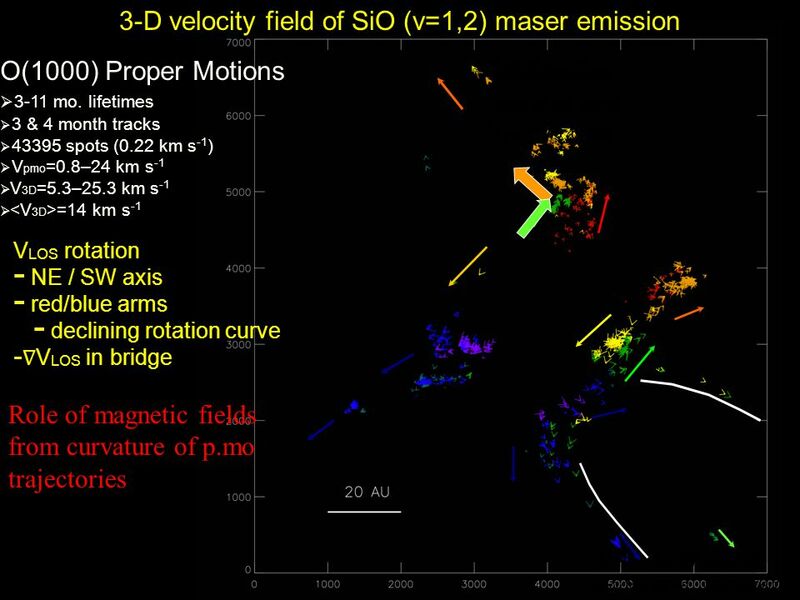 Francesco Trotta YERAC, Manchester Using mm observations to constrain variations of dust properties in circumstellar disks Advised by: Leonardo. Stellar water fountains Hiroshi Imai (Kagoshima University) Contents Discovery and identification of the water fountains Properties of the water fountains. 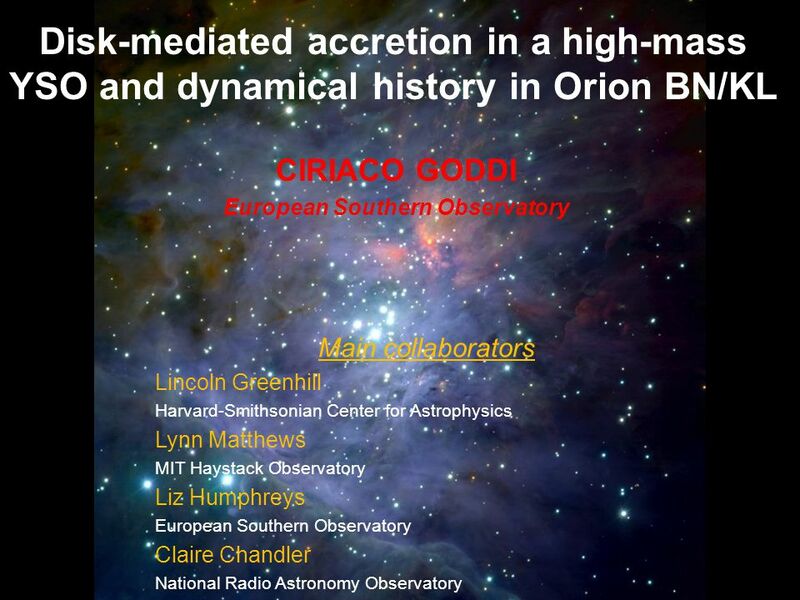 Intermediate-mass star- forming regions: are they so complex? Maite Beltrán Josep Miquel Girart Robert Estalella Paul T.P. Ho Aina Palau. Dense Molecular Gas in Galaxies Near and Far Yu GAO Purple Mountain Observatory, Nanjing Chinese Academy of Sciences. 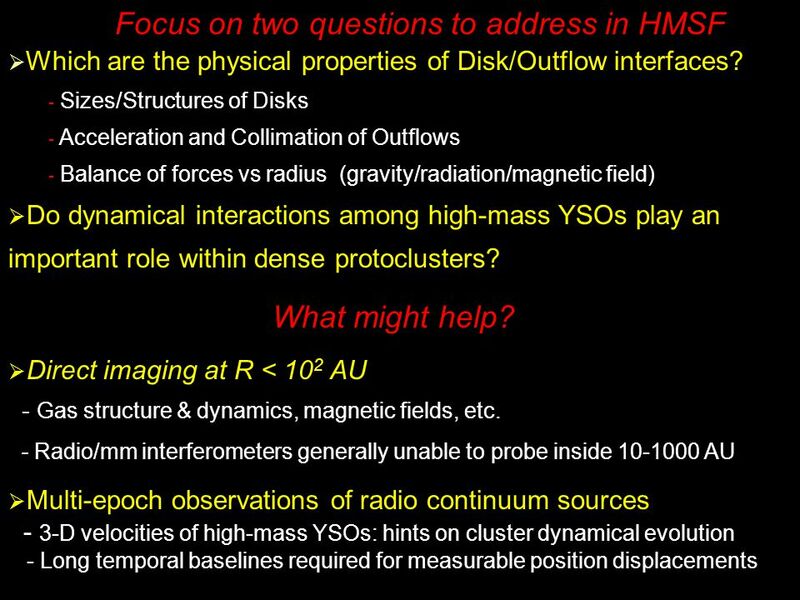 Hot Gas in Damped Lyman- Systems Hidden Baryons & Metals in Galactic Halos at z=2-4 Andrew Fox (ESO-Chile) with P. Petitjean, C. Ledoux, R. Srianand, J. 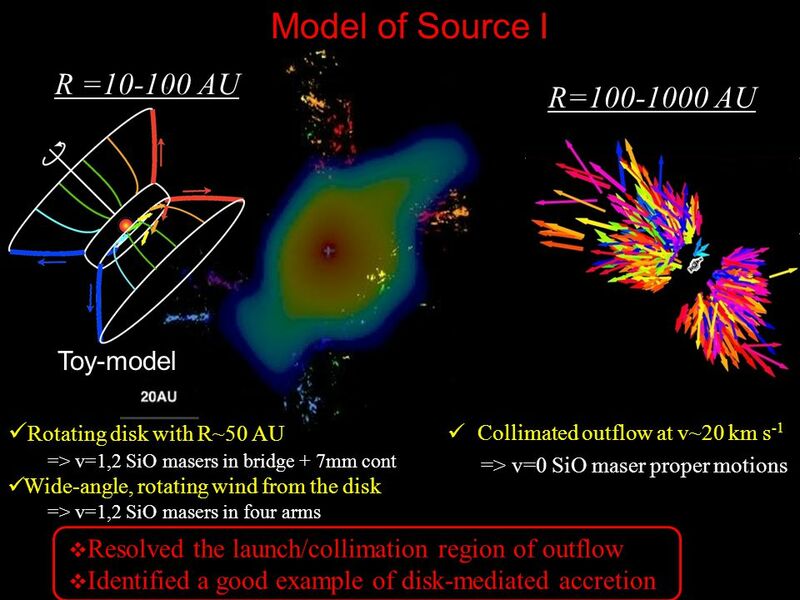 Class I Methanol Masers and Molecular Outflows at 7mm Arturo I. Gómez-Ruiz * MPIfR * Member of the International Max-Planck Research School for Astronomy. Canterbury The problem of star formation is not how to make stars. The problem of star formation is how not to make stars. Cluster Reveals Properties of Cold Plasma Flow May 15, 2009 Erik Engwall. Luminous Infrared Galaxies with the Submillimeter Array: Probing the Extremes of Star Formation Chris Wilson (McMaster), Glen Petitpas, Alison Peck, Melanie.